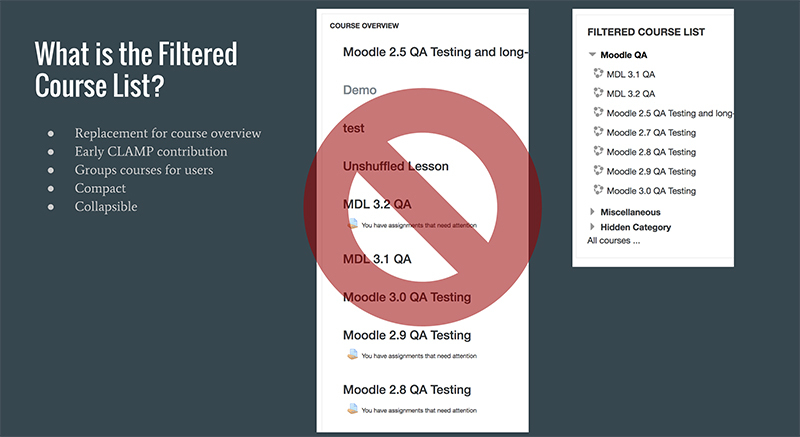 The lead maintainer of the Filtered Course List block, Kevin Wiliarty from Hampshire College, recently added some new features to the plugin, bumping the version up to 3.0 with a seamless upgrade. Filtered Course List is a block that displays a configurable list of courses; intended as a replacement for the My Courses block, although both may be used. FCL is in the Moodle plugin repository and has previously received a Reviewer’s Choice Award. Kevin gave a presentation to highlight the new updates at the Winter 2017 Hack/Doc event at Lafayette College. The upgrade is seamless. Some schools are already using this version of the block in production and it’s working well. The code and documentation can be found on GitHub.